"The address said here." The Wabbit looked all round, then shook his head like a donkey. "It's closed," replied Lapinette. The Wabbit stood his ground. "These are the coordinates I was given." 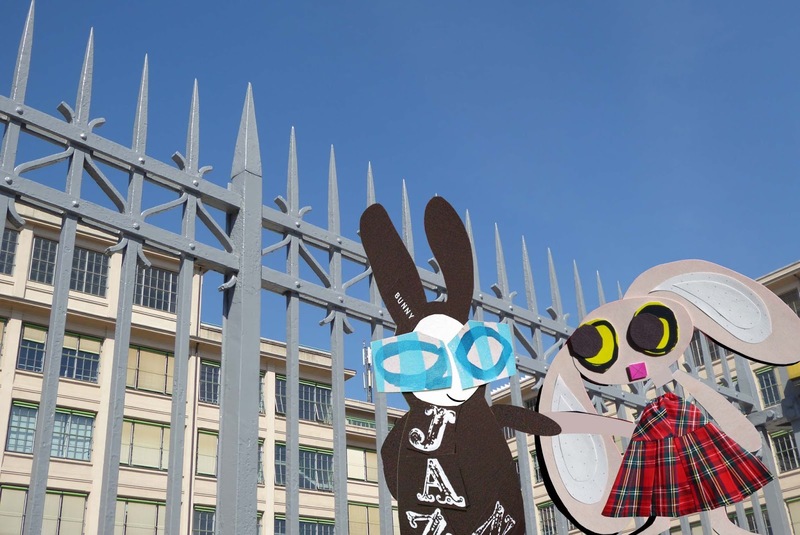 Lapinette gave a mock sigh and nudged the Wabbit. "Couldn't you get an ordinary address like normal rabbits?" The Wabbit shook his head again. "It's how the instructions came." "How did the instructions come?" asked Lapinette. "Carrier pigeon," said the Wabbit. Lapinette wasn't terribly surprised. "Where are the instructions now?" she asked. "I ate them," said the Wabbit. He made a face. "They tasted quite awful. I wanted pistachio flavour." Lapinette stifled a giggle. "What did they taste like?" "Cough medicine," scowled the Wabbit. The street was quiet, as it normally was on a Sunday morning - maybe even quieter. "I'm uncertain why we're here," said Lapinette, "maybe we should wait." The Wabbit grinned and leaned against the fence. "Waiting time with you is always too short." Lapinette pirouetted. "That's because good things come to those who wait." "What kind of good things?" smiled the Wabbit. "Wait and see!" answered Lapinette. The Wabbit looked swiftly from right to left. "Would you care to dance?" Lapinette folded her paws across her chest. "What are your dancing qualifications?" "Bronze Medal," said the Wabbit. Lapinette pretended to swoon. "Teach me!"